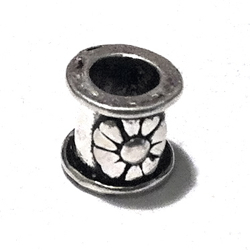 Technique: white shiny surface with a floral pattern, oxidized in the crevices. Usage: any strand jewelry. Use in combination with round beads for better movement to create bracelets. Decorate textile and leather cords.